The Projects screen will be displayed. Click OK to complete project creation process. Project need to be approved before any transactions are raised against it. Click on the Change Status button and select the status approve. You specify project and task options to control how Oracle Projects processes your projects. Project and Task options are available at various levels of your financial and/or work plan structure. 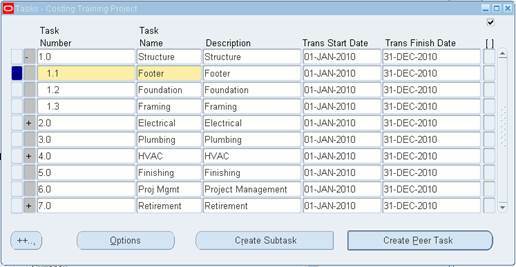 Use the Projects and Tasks windows to specify project and task options. 1. Task Number needs to be entered. 2. Task Name needs to be entered. 3. Description of the Task can be its name. 4. Task Start Date is mandatory and cannot be prior to the Project Start Date. 5. 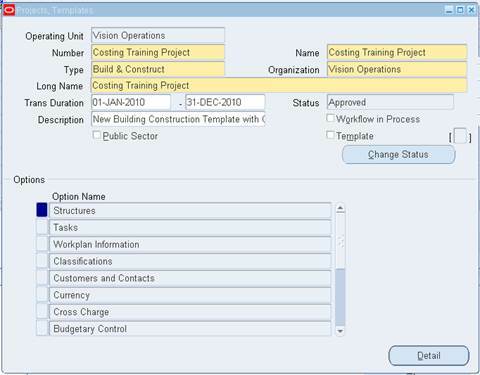 Task End Date needs to be within the active dates of the Project. 7. In the Task Details window, ensure that Capitalizable Checkbox is enabled in order to capitalize the assets booked under a particular task. When a new project is created, the default value for the project currency code is copied from the functional currency defined in the Implementation Options for the project-owning operating unit. 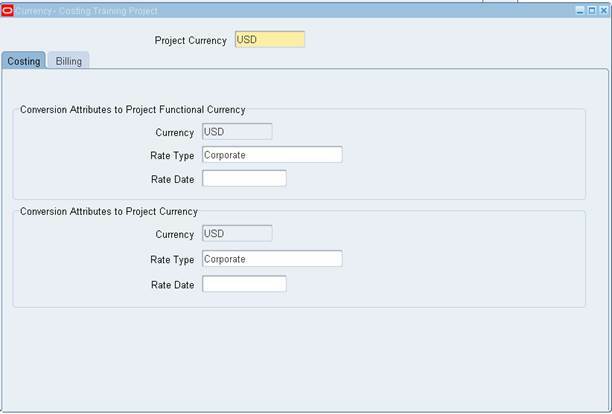 You can override the default currency code and enter default conversion attributes for the project in the Costing tab of the Currency window. You can optionally define costing conversion attribute default values for the Project Functional Currency and Project Currency. These attributes are default values, and entry is optional. The attributes you select are displayed as the defaults during expenditure entry, and are used as defaults for imported transactions. You assign resource lists to a project to indicate which resource lists you want to use for summarizing project actual amounts for project status tracking. When you open the Resource List Assignments window for a project, Oracle Projects automatically displays the default resource list assignment from the project type, and you can enter additional assignments if necessary. Note that you can choose only one assignment as the drilldown default. Resource List: Choose the resource list you want to assign to this project. The resource list defaults from the project type. Use: Indicates the purpose or use of the resource list, such as Status Reporting. Oracle Projects determines this value after you use a resource list in a budget. Drilldown Default: Choose this check box if you want to automatically drilldown by resource list for project status tracking. If you enter additional assignments, only one assignment can be the drilldown default. You can define assets for capital projects to account for capital assets and retirement adjustment assets. You define capital assets to account for assets that you plan to build or place in service during the course of the project work. You define retirement adjustment assets to account for costs and proceeds of sale associated with the retirement of group assets in Oracle Assets. In Oracle Projects, you can define all of the information that is required to classify capital and retirement adjustment assets, and interface the assets, along with the associated costs and proceeds of sale amounts, to Oracle Assets as asset lines. For information on the attributes that you can define for an asset. 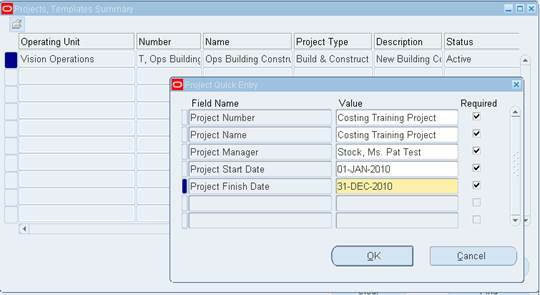 You can define assets for a capital project in the Assets window. To access the Assets window from the Projects, Templates window, select and expand Asset Information from the list of options. After you define a capital asset or a retirement adjustment asset for a capital project, you can assign the asset to the project level, or to one or more tasks. You assign an asset to the project or to a task to associate the asset with the underlying costs or proceeds of sale. You can assign assets to top tasks and lowest tasks. You must enter the Asset Name you want to assign to the project or task, and specify whether you want to use a Grouping Level for Specific Assets or Common Costs. 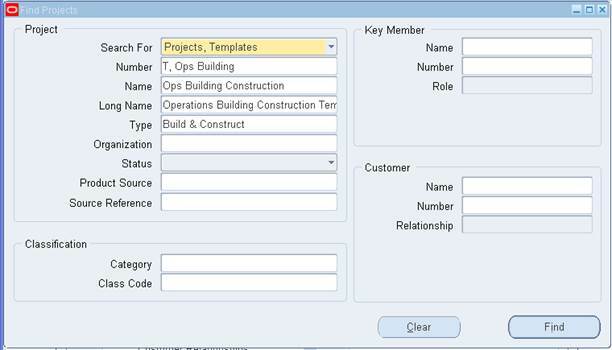 To enter asset assignments in the Asset Assignments window, you must select and expand Asset Information from the list of options in the Projects, Templates window.